When the Show Undo Selector button is enabled ZBrush will display small boxes at the top of the canvas area to indicate the number of undos available for the selected SubTool. If you place the cursor over a box then the date and time of the undo will be displayed. When the Show Time Stamp button is enabled ZBrush will not(?) display the date and time for each undo selector box. 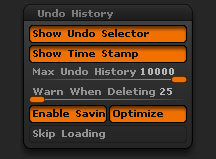 The Max Undo History slider will set the maximum number of undos ZBrush will store for each SubTool. The Warn When Deleting slider will set the number of undos for which a warning will be displayed should the following action delete that number or higher. When the Enable Saving button is pressed ZBrush will save all undo history within projects. The Optimize option helps reduce the size of the Undo History in your project files. This option is enabled by default. When the Skip Loading button is pressed ZBrush will skip loading undo history when any project is loaded into ZBrush.